Kinases have been the target of extensive research to identify drugs to treat a variety of diseases in which the wild-type kinase or a mutant kinase plays a crucial role. Kinase mutations frequently lead to an activated state where the kinase is always active and no longer tightly regulated. Considering resistance mutations are also important for kinase inhibitors. A frequent escape route is a mutation to the gatekeeper amino acid that blocks inhibitor binding. A variety of large screening panels have been developed that range from binding assays to enzyme assays, each with their unique pros and cons. 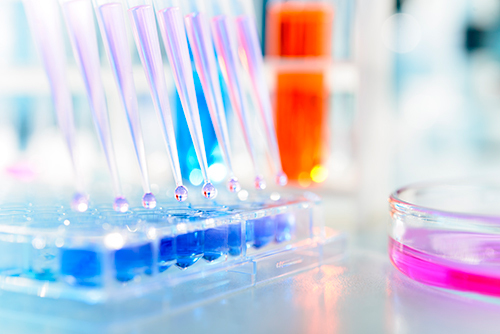 Having a variety of assay formats allows hits to be confirmed in orthogonal assays. When a compound of interest is screened against a large kinase panel, unexpected “off-targets” can be identified. These off-targets can themselves be of interest for other uses, such as repurposing. Drug repurposing has been hotly pursued by many groups, and here the authors took 183 small molecules, including 12 FDA-approved drugs, and screened them against a panel of 76 mutant kinases (covering 21 wild-type kinases), where all but 8 of the mutations have been implicated in a human disorder. The assay utilized was a HotSpot radiometric filter-binding kinase assay. The authors screened at one concentration (500 nM) of compound and used 10 μM ATP for each kinase. Most kinases have a Km >10 μM, and most kinase inhibitors are ATP competitive, although there is much interest in developing (and some success with) inhibitors that target other pockets. It would be interesting to know the range of Km values for the mutants studied here to see how different that ratio of [ATP]/Km is across this panel given the fixed ATP concentration. It's expected that the majority of [ATP]/Km would be less than one, and thus the affinity for ATP competitive inhibitors would be quite accurately measured at this fixed concentration. Figure 1 shows the % remaining kinase activity heatmap for the screen that includes data on the 21 cognate wild-type kinases from an earlier paper. It can be seen that some kinases are more frequently inhibited and that some compounds are not very selective across this panel. The authors show good concordance with their current data and previous large-scale screens, usually orthogonal assay formats. A compound known to target EGFR/ErbB2/ErbB4 was identified as having excellent selectivity for T790M mutant EGFR (gatekeeper mutation). They also identified several compounds with activity against the T641I imatinib-resistant mutation of PDGFRα. This study contains more mutant kinases than earlier large screens and helps to grow the database of compound-kinase interactions further. Figure 1. Large-scale screen of kinase/compound pairs. 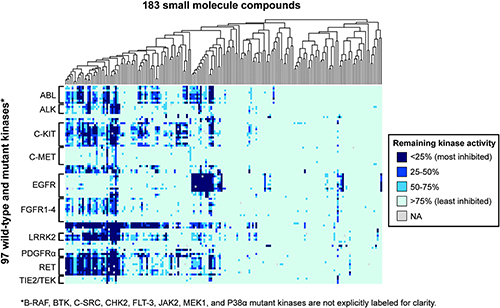 Shown is a heatmap representing the distribution of remaining kinase activities for kinase/compound pairs in this study as well as data for their wild-type cognates, as reported previously (Anastassiadis et al., 2011). The 183 compounds in the screen were subjected to hierarchical clustering, as shown by the dendrogram at the top. The 76 mutant kinases are grouped according to cognate wild-type kinase. Only kinase families with three or more members are labeled for clarity. A fully labeled version of this figure is provided in Figure S1; and the complete dataset is available in Table S2 and can be searched at the Kinase Inhibitor Resource. Small-molecule kinase inhibitors have typically been designed to inhibit wild-type kinases rather than the mutant forms that frequently arise in diseases such as cancer. Mutations can have serious clinical implications by increasing kinase catalytic activity or conferring therapeutic resistance. To identify opportunities to repurpose inhibitors against disease-associated mutant kinases, we conducted a large-scale functional screen of 183 known kinase inhibitors against 76 recombinant mutant kinases. The results revealed lead compounds with activity against clinically important mutant kinases, including ALK, LRRK2, RET, and EGFR, as well as unexpected opportunities for repurposing FDA-approved kinase inhibitors as leads for additional indications. Furthermore, using T674I PDGFRα as an example, we show how single-dose screening data can provide predictive structure-activity data to guide subsequent inhibitor optimization. This study provides a resource for the development of inhibitors against numerous disease-associated mutant kinases and illustrates the potential of unbiased profiling as an approach to compound-centric inhibitor development. ASSAY & Drug Development Technologies, published by Mary Ann Liebert, Inc., offers a unique combination of original research and reports on the techniques and tools being used in cutting-edge drug development. The journal includes a "Literature Search and Review" column that identifies published papers of note and discusses their importance. GEN presents here one article that was analyzed in the "Literature Search and Review" column, a paper published in Cell Reports titled "Kinase inhibitor profiling reveals unexpected opportunities to inhibit disease-associated mutant kinases." Authors of the paper are Duong-Ly KC, Devarajan K, Liang S, Horiuchi KY, Wang Y, Ma H, Peterson JR.